In 2002, Hofstra created the Middle Eastern and Central Asian Studies (MECA) program (http://www.hofstra.edu/Academics/Colleges/HCLAS/MECA/) to complement other area studies program on campus. This program currently offers undergraduate students a minor that includes a Middle Eastern Language, an introductory course to the region, and a variety of courses in anthropology, art history, economics, history, political science, and religion on the Middle East. The MECA program also sponsors invited speakers to campus. The founder and director is Daniel Martin Varisco (Anthropology). Participating faculty include Massoud Fazeli (Economics), Anna Feuerbach (Anthropology), David Kaufman (Religion), Mustapha Masrour (Comparative Languages and Literatures), Fatemeh Moghadam (Economics), Stephanie E. Nanes (Political Science), Aleksandr Naymark (Art History), Hussein Rashid (Religion), Mario Ruiz (History), and Irene Siegel (Comparative Languages and Literatures). MECA has sponsored several speakers about Iraq to campus. 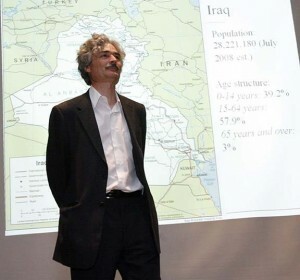 In 2009, with joint sponsorship from TAARII, a panel on “Iraq: How the Past Shapes the Future” was held. The participants included Orit Bashkin (Professor of Near Eastern Languages and Civilizations, University of Chicago and author of The Other Iraq: Pluralism and Culture in Hashemite Iraq), Magnus Bernhardsson (Professor of History at Williams College and author of Reclaiming a Plundered Past: Archaeology and Nation Building in Modern Iraq), Eric Davis (Professor of Political Science at Rutgers University and author of Memories of State: Politics, History and Collective Identity in Modern Iraq), Bassam Yousif (Professor of Economics at Indiana State University and author of Development and Political Violence in Iraq), and Nida al-Ahmad, Department of Political Science, the New School. For more information on this panel, please see “The Making of Modern Iraq,” in TAARII’s Fall Newsletter, Issue 04-02, available as a PDF on TAARII’s website (www.taarii.org/newsletters). Hofstra University was founded in 1935 and is located in Hempstead, Long Island, 25 miles east of NYC. It is a private, nonsectarian, coeducational institution with Schools of Business, Communication, Education, Engineering and Applied Science, Health Sciences and Human Services, Law, Liberal Arts and a Medical School. Hofstra has 517 full-time (75% tenured) and 618 part-time faculty. The total fall 2012 enrollment was 11,090 (6,899 Undergraduate, 3,078 Graduate, 1,008 Law, 105 Medicine). About 3,800 students live on campus in 37 residence halls. The Hofstra libraries contain over 1 million volumes and provide 24/7 online access to more than 55,000 full-text journals and 70,000 electronic books.